First, let me apologize. I’m new with this blogging package so my picture is not the usual size. Please click on it and you will get the full resolution version. Any input on this new format is much appreciated. Alright, now let’s get to the food. The pictured pie is from a new pizza place in my neighborhood called Coalfire Pizza, located at 1321 W. Grand Avenue. It’s a rugged stretch of Grand Avenue but has a lot of great food. This place is a fine addition to the neighborhood and is probably the best Neapolitan style pizza I’ve had in town (barely edges out Spacca Napoli and Sapore di Napoli). Coalfire is evidently the hottest, most even fire going. You pop the pizza in the coalfire oven and the bottom gets crispy while the top stays soft and gooey. That’s what it’s like. You get this crispy bottom combined with a soupy like top. Take another look at that picture. The tomato sauce, cheese, and olive oil mix with the top portion of the crust to form this viscous topping. It’s difficult to explain and quite original. I have not tasted anything like it in Chicago. I got the sausage pizza. 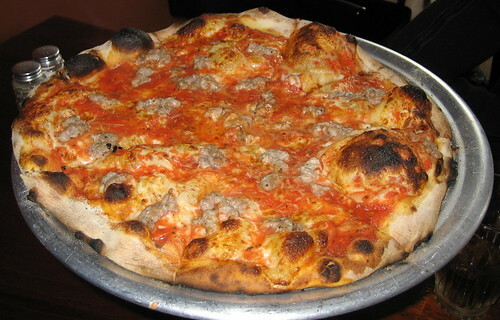 It had tomato sauce, mozzarella, Italian sausage (sweet or hot), and olive oil. It was $14.50. Very good. They have a strange service methodology though. You come in, take a seat, the hostess brings you a menu, then you actually go up and order/pay at the counter. Pretty odd. Then they bring the pizza out to you…I left a 15% tip. Is that too much? Too little? I don’t know. The owners are local restaurant guys that grew up in Massachusetts (according to Metromix). I guess this is modeled after a pizza place out east. Definitely worth a visit, even if you are a Chicago-style pizza lover. Posted in food on 2007/06/04 by John.